Ross Andru and Mike Esposito Flash #183 Cover Original Art (DC, 1968). How could this overconfident hitman possibly expect to kill the Flash with a slow-moving bullet? One of the classic Ross Andru Flash covers of the late 1960s, this suspenseful cover hook for "The Flash's Dead Ringer" is a must-have for any Silver age DC fan! This piece has an image area of 10" x 15". 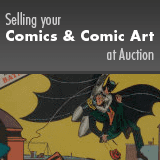 The Flash masthead, DC logo, and other type elements are all vintage, and the art is in Excellent condition.